An aging retail building with a fantastic location on Lake Street in Minneapolis, midpoint between LynLake and Uptown, the building lacked identity and needed significant basic repairs before it would be considered commercially viable. 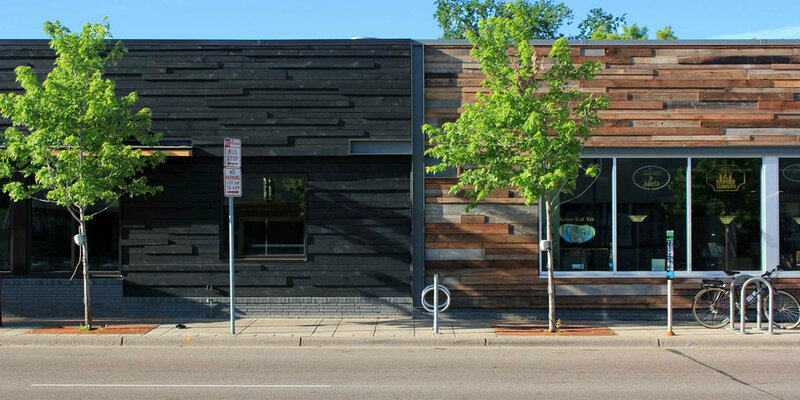 Two retail spaces were given unifying but distinct exterior identities using a simple reclaimed wood 'shaggy' wall with contrasting colors. The east space is designed as a restaurant with large fully operable windows and cafe and patio seating. The west a retail space with a steel entry surround. The exterior is reclad including a new roof and all new openings, significantly improving it's ability to withstand Minnesota's demanding climate. Sometimes sustainability is as simple as letting a building thrive for another generation. In the market for a refresh?